New York Oct 2 59 Wm Eno Esq. 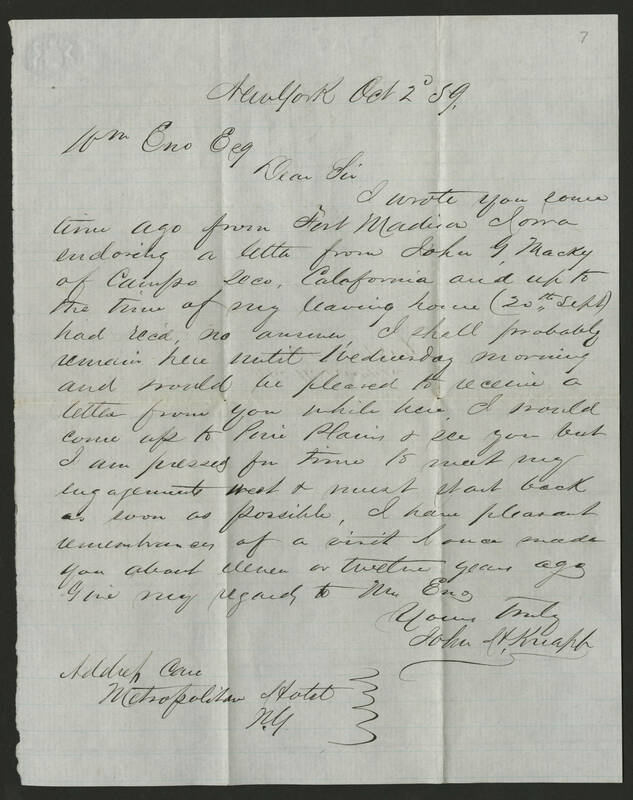 Dear Sir I wrote you some time ago from Fort Madison Iowa enclosing a letter from John G. Macky of Campo Seco, California and up to the time of my leaving home (20th Sept) had rec'd no answer. I shall probably remain here until Wednesday morning and would be pleased to receive a letter from you while here. I would come up to Pine Plains & see you but I am pressed for time to meet my engagements [west?] & must start back as soon as possible. I have pleasant remembrances of a visit I once made you about eleven or twelve years ago. Give my regards to Mr. Eno, Yours truly, John H. Knapp Address Care Metropolitan Hotel N.Y.